Chuks Global Telecoms Resources Ltd.
Do you have a question or comment about Chuks Telecoms Global Resources Limited ? Use the form below to contact us with your inquiries or comments about our products and services, phones and e-mails are also encouraged or better still if you feel like meeting us in person our addres is on this page and the map by the right should help you in location our spot. We are located right at the heart of Apapa, Lagos. 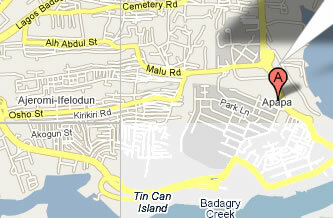 The map direction below helps even a first time visitor to the city of Lagos to find our exact location.